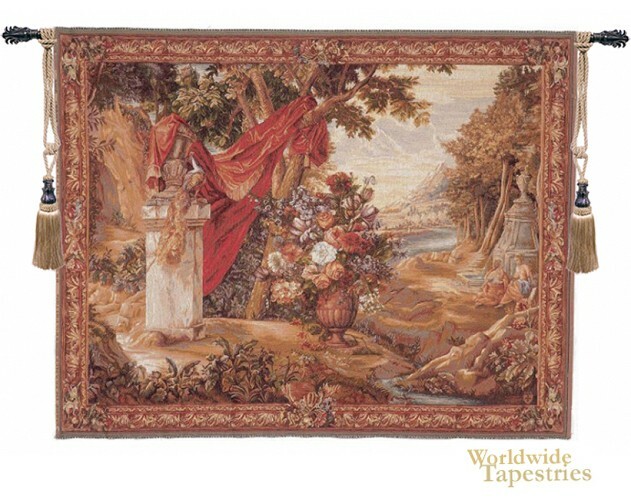 Cheval Drape With Vase tapestry shows a work inspired by the Flemish 18th century tapestries. The red drape and flowers in an urn were used as decorative elements in both countryside and palace side scenes to represent beauty and luxury. Here in this work we see superb details in the foliage, flowers, tree leaves in this fantasy scene of lavishness as only the 18th century artists can show. The blue river contrasts beautifully with the warmer tones of the burnt orange grounds. An ornate border completes the scene. This scene is a celebration of society's beauty among the beauty of nature. This Cheval Drape With Vase tapestry is backed with lining and tunnel for easy hanging. Note: tapestry rod and tassels, where pictured, are purchased separately.